Tag line: "For they shall inherit the earth... sooner than you think!" Quite often the victims of heavy-footed pedestrians or mean-spirited kids with magnifying glasses, the ants of the world finally get their revenge in Bert I. Gordon's 1977 Sci-Fi extravaganza, Empire of the Ants. Florida Realtor Marilyn Fryser (Joan Collins) takes a group of investors on a tour of some dubious beachfront property, but doesn't realize the surrounding waters are being used as a dumping ground for radioactive waste. When a leaking barrel washes up on shore, it causes the local ant population to mutate, transforming thousands of the insects into giant-sized carnivores. Surrounded on all sides and under constant attack, Marilyn and a handful of survivors make their way to the nearest town. But are they safe there? It takes a while for the six-legged killers in Empire of the Ants to make their move. Far too long, if you ask me. Or maybe it just seemed longer in the company of these bland, boring characters. In fact, the only one I found even remotely interesting was Joan Collins' Marilyn, the bitchy real estate agent looking to bilk innocent people out of their hard-earned cash. The first third of the film features a lot of standing around, eating of snack food, and complaining about everything under the sun. It isn't until they all climb into a tram that we're given our first hint the ants are nearby (the creatures make a very distinctive sound). Then, just when it looks like the gargantuan insects are ready to make their move, the tram stops at a rest area, where everyone is treated to yet another small snack. Seriously, they ate 10 minutes ago! What's with all the damn food? Of course, when the ants finally do turn up, we see why the filmmakers weren't in any hurry to trot them out. 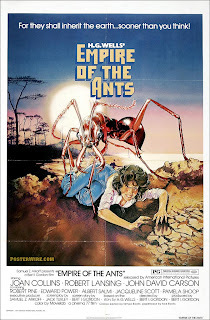 The first victims, Tom Lawson (Jack Kosslyn) and his wife Mary (Ilse Earl), are surrounded by a dozen or so giant ants, resulting in an encounter chock full of unintentional humor. The problem isn't so much with the walking ants, which are real insects magnified to make them appear larger. It's the attacking ones, little more than walking "ant suits", that had me chuckling. Whether anyone's inside the suits or not, I can't say. Truth is, I'm not even 100% sure they are suits, because these costumes (or whatever) are so bad that director Gordon tried to conceal them as best he could, shaking the camera wildly whenever they popped on-screen. He did this to prevent the audience from getting a good look at them, but we see enough, and each successive “attack” is more uproarious than the last.